Among other things, BioCurious is a "gym membership for your brain"
You may be familiar with the proliferation of hackerspaces around the world for computer and technology enthusiasts. These groups gather and share knowledge about hacking technology, but this usually involves computers, electronics, software, etc, but a new type of hackerspace is beginning to emerge. Dedicated entirely to biology, bio-tech hackerspaces involve enthusiasts hacking the materials of life, bringing the wet lab to the common people. Joseph Jackson, co-founder and director of policy and strategy of BioCurious, was kind enough to answer some questions about the DIY bio movement and his group which is starting what could be the world's first bio-hackerspace. Tim: There’s been a lot of buzz recently about your group, “BioCurious” from various sources (BioTechniques article, nature article 1, nature article 2). On the group’s website, it mentions the main objective is to build a bio-tech hackerspace. We might have a general idea of what this might be, but we had the pleasure of asking Joseph Jackson of BioCurious directly about this new group and some ideas for the future of DIY biotechnology movement. Can you explain for us what you mean by biotech hackerspace? 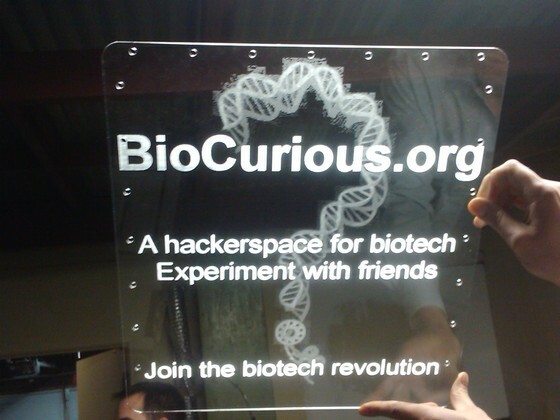 Joseph: BioCurious is one of the first examples of a hackerspace dedicated to biology. Most are familiar with the idea of a hackerspace where groups of technology enthusiasts gather to work on software, hardware projects, or even art. In adapting this model for biotech, we are providing a basic infrastructure for hobbyists to learn essential skills in molecular biology and conduct experiments in a group setting with access to mentors and assistance in troubleshooting if they get stuck. Despite the mythical image of the lone garage biohacker, it is a lot easier to learn certain skills in a group setting instead of relying solely on protocol descriptions, text books, mailing lists or videos. Our "hackerspace" is a hybrid entity combining many aspects of existing spaces where the public currently encounters science. For example, we'll have some aspects of a museum, in that we'll hold demos and other hands on activities where the public can have a brief exposure to the ideas underlying modern biology. I'm personally excited about having bioartists visit and eventually hosting exhibits that feature their work. We'll also have an entrepreneurship component seeking to develop the skills and the attitude necessary for the new generation of biotech company founders coming of age in the era of ultra cheap sequencing and synthesis technologies. Finally, there is also a training aspect, like a merit badge certification for completing certain skills like purifying a protein or cloning a gene. We may be able to reach out to industry to create a unique bridging program for people looking to get a job in biotech who have completed their undergraduate degree but still lack sufficient post-classroom practical bench experience for companies to take a chance on them. Another idea I'm considering is having a science journal club in which members meet to present an article each week. Scientific journal literacy is not something the general public or even science students acquire until they've waded through enough publications by their third year of study maybe, so this is really an essential skill. So, we're part museum, community college, and idea "incubator" but since we don't have the the resources of those entities we don't expect to "beat them at their own game." We don't claim to do things better than these existing institutions, but we will enable people to work on different sorts of problems in a different way. In sum, BioCurious aims to democratize, demystify, and domesticate biotechnology by bringing together academia, industry, and members of the public to collide and collaborate in novel ways in a non-institutional setting. Our space fills the void in the niches left unexplored by University or Corporate labs. By getting these different sectors to interact, we can beneficially disrupt the way life sciences research is done. In the process, DIYers will become a bit more "professional" and professionals will rediscover that essential curiosity that brought them to science, especially if they are feeling a bit burned out in their day job. Tim: As with any new platform, there might be some “killer app” (maybe a bad word, we don’t want to scare anyone!). In the DIY bio movement, do you have any ideas about the type of revolutionary invention or “amazing app” might come about? Is the vision for desktop PCR part of this? Joseph: It is hard to predict what kinds of products or advances will emerge from the movement. At our meetups, the ideas are sometimes wild, weird, and wacky. We've had people who have vineyards and are interested in doing something related to their hobby by altering the grapes/wine. We had one guy who had problems with deer eating his garden and wants to make a better home brew deer repellent. One idea that's been suggested several times is making glowing plants for the novelty/wow factor. Its simple enough to do and could get people talking. Food is a popular interest, so we've discussed holding a "molecular gastronomy" course sometime but we have to be careful to avoid any "Frankenfood" hysteria and otherwise be mindful of the paranoia that surrounds GMOs. I think environmental sensing is a big area that citizen science can get involved with. iGEM (the International Genetically Engineered Machine competition at MIT) produces more impressive projects each year, and those ideas are a source for projects that could have further work done on them in a community lab. My work with LavaAmp is, of course, one step toward spreading the tools of biotechnology to an entirely new set of users just learning about this field. My partner Guido and I initially started this to enable low cost diagnostics in places like Venezuela, where he's from, but we're excited about the DIY potential as well as our goals to improve public health. Lots of hardware projects will spring up in the coming years. Within a decade, I expect one of the most disruptive advances, desktop synthesis machines affordable enough for hobbyists. When that happens, things will get really interesting. 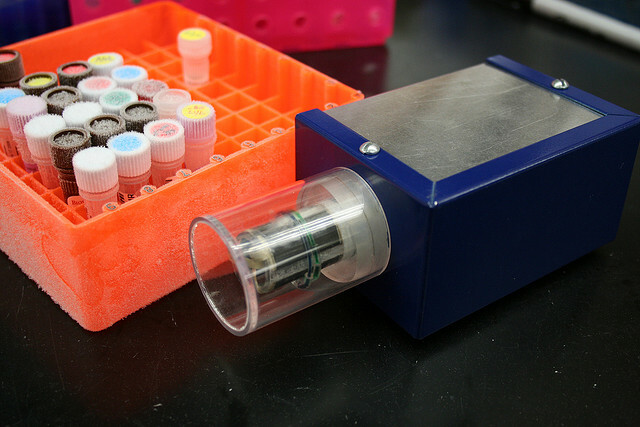 The low-cost PCR machine designed by LavaAmp brings the possibility of duplicating strands of DNA to DIY-Bio enthusiasts. Tim: What are the biggest misconceptions about the DIY biotech movement? Joseph: The single biggest misconception is the immediate jump to the idea that doing biology in a non traditional setting (eg not in a "pristine" institutional lab) is some kind of safety threat. As one member of the New York City DIY group put it to me in a conversation, "its not that hard to get safety right." The bar is pretty low for complying with correct safety procedures. Gloves, eye wash station, fire extinguisher, proper disposal of reagents, its not rocket science folks (in fact rocket science involves substantially greater risk of blowing yourself up and amateur rocket hobbyists are doing just fine). Standard safety materials can be adapted from existing training used for orientation in university courses, community colleges and even high schools. Furthermore, we will even go above and beyond this standard since we're often subjected to additional concern. The activities we're conducting don't involve any pathogens or anything that isn't done everyday in educational classes around the world. Finally, I'll remind everyone that Penicillin, one of the greatest advances of the 20th century, was discovered by accident when Alexander Flemming returned from holiday to find his cultures contaminated by mold. A lapse in basic 101 sanitation procedure turned out ok after all! The same goes for the early days of cell culture technique, when the immortal Hela line was mailed to researchers all over the world so they could get proficient with the new technique (and as discovered later, contaminating huge numbers of other cell lines which invalidated lots of work and ruined careers!) I point this out not to belittle the need for safety, but to provide some historical context as to how science advances and what the real risks are. Much more difficult than simply not harming ourselves and others, is actually doing something scientifically noteworthy. Its almost ridiculous the amount of attention we've received merely for doing some basic science in a garage (where BioCurious initially met...note we've moved to a more formal setup precisely to be able to serve the public in a facility that moves away from the garage image). I competed in bodybuilding and powerlifting for many years, initially training at a home gym I built for a couple thousand dollars. Nobody called me up to interview me about my backyard weightlifting equipment. Yet it is important to realize that weightlifting was a fringe activity for decades and only during the mid 1980's did a version of the bodybuilding lifestyle enter the mainstream public consciousness in the form of the first franchised commercial "fitness clubs" (Gold's, then Bally's, etc). Today gyms are everywhere. Think of BioCurious as gym membership for your brain. For a fit population, you need a commitment to "physical culture" (a term not used much these days) and access to exercise equipment for everyone. The same goes for a scientifically literate population. An important corollary, however, is that we have more gyms per capita in the US than at any time before, at precisely the same time the obesity epidemic rages out of control. Just having large numbers of commercial gyms, does nothing to ensure the most vulnerable populations are served, since these users often can't afford the membership fees. Indeed, many fitness club chains now cater to the upper middle class professional, who is often more concerned with socializing while looking cool on the latest cardio machine than pumping serious iron!! Community engagement is the key, whether in science or in health. Hackerspaces may face a similar fork in the road in the future, as this activity becomes more mainstream and franchised, generic, commercial, pay to play technology spaces proliferate. There is a role for both, of course, but a community of enthusiasts supporting one another's projects is very different from a collection of customers. In a way, we will have won once "biohacking" is no longer newsworthy and science spaces are common. After all, humans gather together in all sorts of clubs an entities to do activities ranging from scuba diving to hang-gliding, both of which involve more significant risk of death than "molecular biology gone wrong." Tim: For readers out there who are interested, of course we’re including contact information, etc, but do you have any suggestions or advice you’d like to give? Joseph: It is my hope that labs for citizen scientists spring up all over the world. We're concentrating on making our effort succeed in the Bay Area first, but I expect similar initiatives to spread. Initially, everywhere there is a critical mass of life sciences (eg Seattle, LA, Boston, Baltimore/DC) is a place where community labs could thrive. BioCurious will eventually document all the essential steps needed for setting up a lab. I'm available to share our experiences and, when things are sustainable here, I could even come in person to visit and assist. Tim: Thank you Joseph for your time and insights, we’re looking forward to following your group and the exciting projects that come from it! ***Go to the BioCurious Website to join their mailing list!